OMEGA™ quick disconnect thermocouple probes are manufactured from class 1 tolerance mineral insulated (MI) cable and can be formed to shape to suit many different applications. 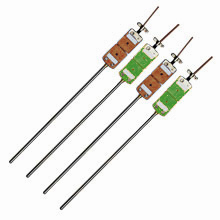 They are terminated with a standard size, round-pin, colour-coded thermocouple quick connectors. The mating socket and a cable clamp are included in the price. 300 mm Length	 Model No. 450 mm Length	 Model No. *Specify junction type: E (Exposed), G (Grounded) or U (Ungrounded/Insulated).